Amazing is a word that may be over used at times along with Awesome, Super, and Fantastic. 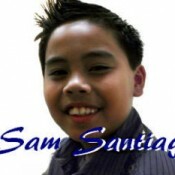 However, when it comes to young singing sensation Sam Santiago, somehow they all just fit. I recently spent a week in California visiting the Santiago Family and was privileged to follow along with Sam and his family as they went about their daily schedules. I have to tell you that this family leads an exciting and busy life. Of course they were not only wonderful hosts to my wife and I but it gave me an inside opportunity to see just what a fine oiled machine their family has become in order to keep up with Sam’s busy entertainment schedule. Of course this is not even to mention Sam’s school schedule, concerts, and activities that every normal soon to be ten year old has as part of his daily life. 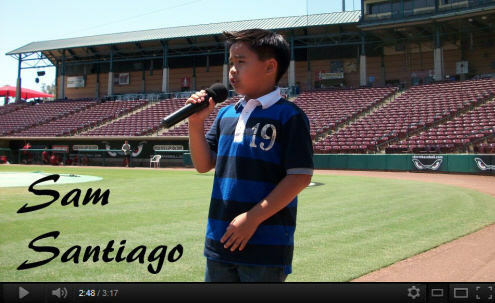 Our first weekend was filled with excitement right off the bat, (Pun intended), as Sam was scheduled once again to sing the National Anthem for the Minor League Storm Baseball Team game that Sunday. We arrived early for a practice run around 11:00 am. The field was in the grooming process and looked brilliant and colorful with fresh stripes of white outlining the bases and gorgeous green fields. Sam walked confidently to the front of the bullpen area and took the mic from our host. What a treat to hear Sam’s young vibrant voice rattle the empty arena with his clear sounding acappella rendition of our National Anthem. If you would like to hear and see the practice run visit Young Artists Global Facebook where that exclusive is posted. Sam belts it out for the opening of the Game! While this site makes ready our normal weekly publication, I felt compelled to share with you two sensational videos that demand more media attention than what our complementary Facebook site Young Artists Global could offer. Recently this year’s American Idol contest featured the female contenders singing their renditions of the iconic songs of one of the most amazing singer/actress of our time, “Whitney Houston”. 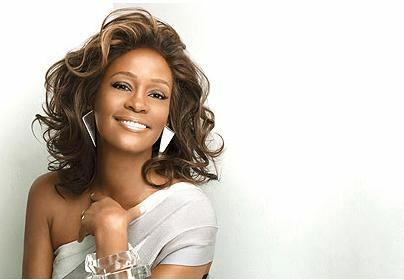 Among them were Whitney’s two biggest songs “I Will Always Love You” and “I Have Nothing”. While the contestants who performed these two numbers received accolades for their interpretations, the judges also stated that both of these songs presented an enormous challenge for any singer, due to their difficulty and the vocal range required for a good performance. 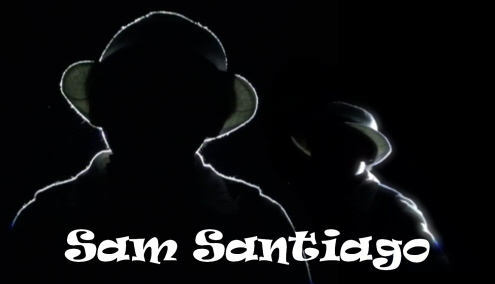 After reading some of the comments on the YouTube Channels of Aj Silva and Sam Santiago, I could not allow this opportunity to slip by without sharing both of these amazing musical tribute videos here. Aj Silva was recently featured here just two weeks ago, and while his video tribute had only been released the day before the publication, he was already enjoying hundreds of views. His video has now piled up nearly 8,400 views in just two weeks time and doesn’t show any signs of slowing down! It is with great pleasure that I present this video one more time for those of you who may have missed Aj’s outstanding performance which is truly a cover of unspeakable proportions. Sam Santiago’s last full feature article was published back in September when he was visiting Michigan and appeared on WZZM TV singing a cover of Adele’s song “ Rolling In The Deep”. 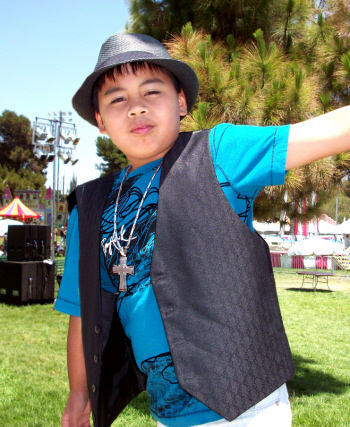 Since that time Sam has been singing at a variety of events in California and continues to amaze every audience that is assembled. His cover of Whitney’s Song “I Have Nothing” also serves as not only a wonderful tribute to Whitney and her amazing musical career ,but also demonstrates that this nine year old boy has a talent that is beyond compare for one so young. This site takes its hat off to these two young men for their very special performances. You can be sure that you will be seeing much more from both of them in the near future not only on this site, but in the headlines of major media and networks. Congratulations Aj Silva and Sam Santiago for your outstanding accomplishment! We wish you the very best of success in your musical pursuits and careers.